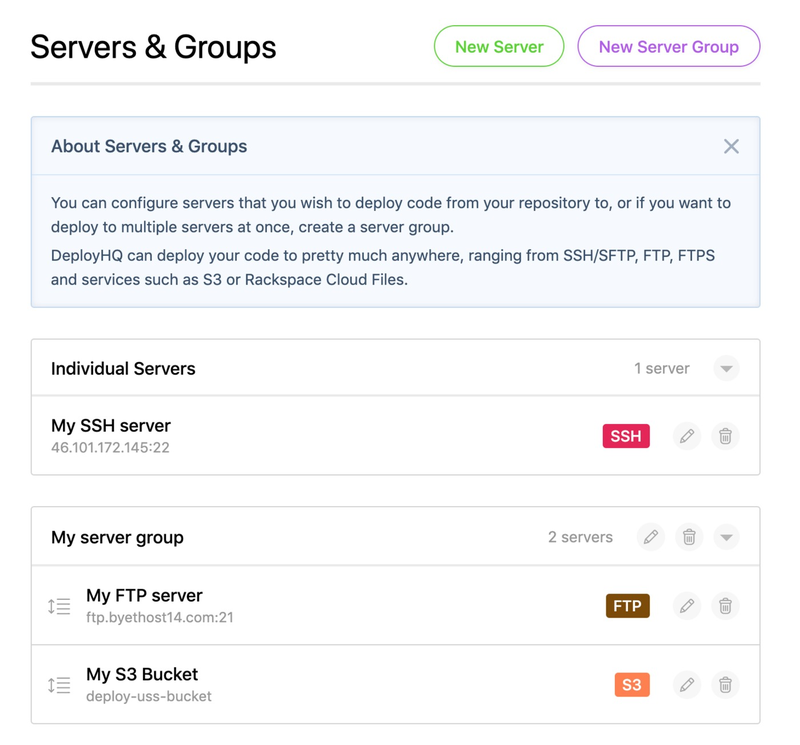 You may want to group servers together when using DeployHQ, to be able to run a single deployment to all of them at the same time. 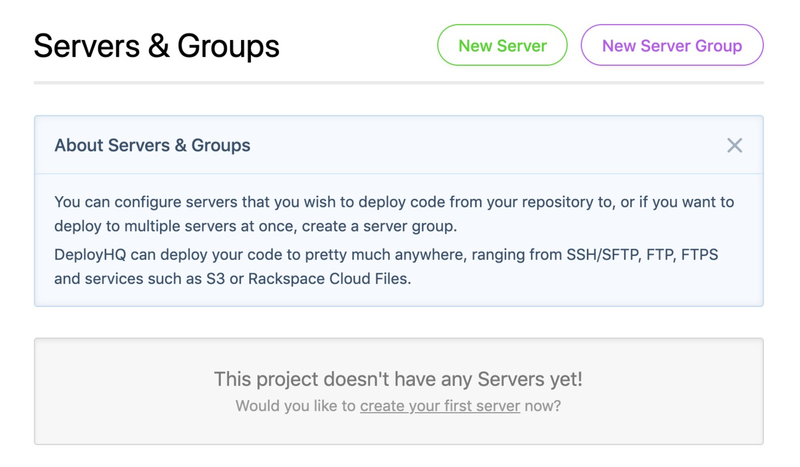 To add a new server group to your project, head to Servers & Groups on the left hand side of the page, then click the New Server Group button on the right hand side. 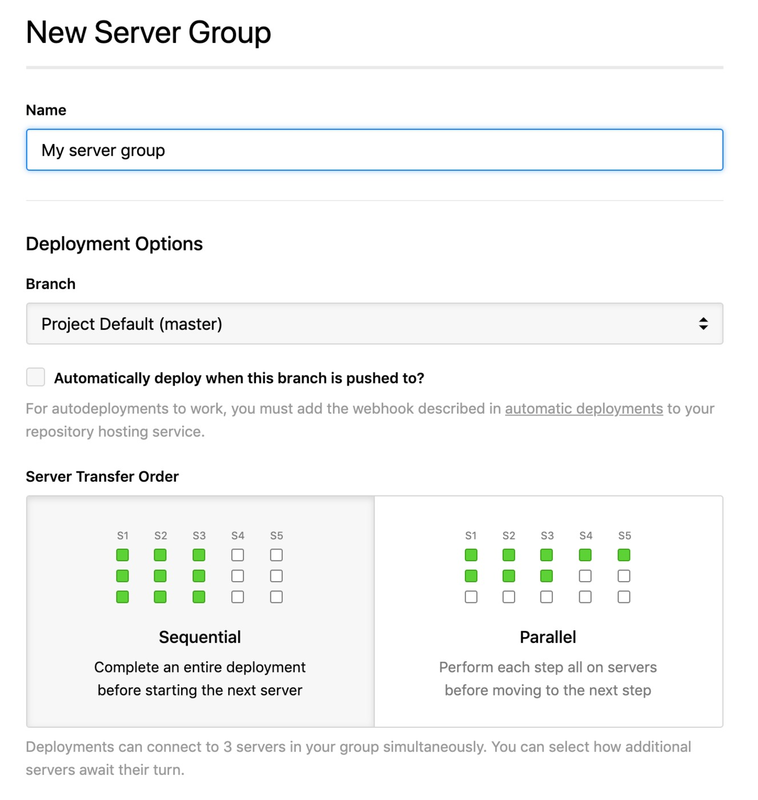 Add a name for your server group, choose if you wish to automatically deploy to it, the default branch to deploy from, then select the transfer order. You can select a sequential or parallel transfer - sequential transfers wait for one server to finish its deployment in full before starting on the next server, and parallel transfers will start a deployment at the same time to a maximum of 3 servers. With this method, each "stage" of the deployment (such as pre-flight checks, or the file transfer process) must complete on all of the servers currently being deployed to before the next stage can begin. 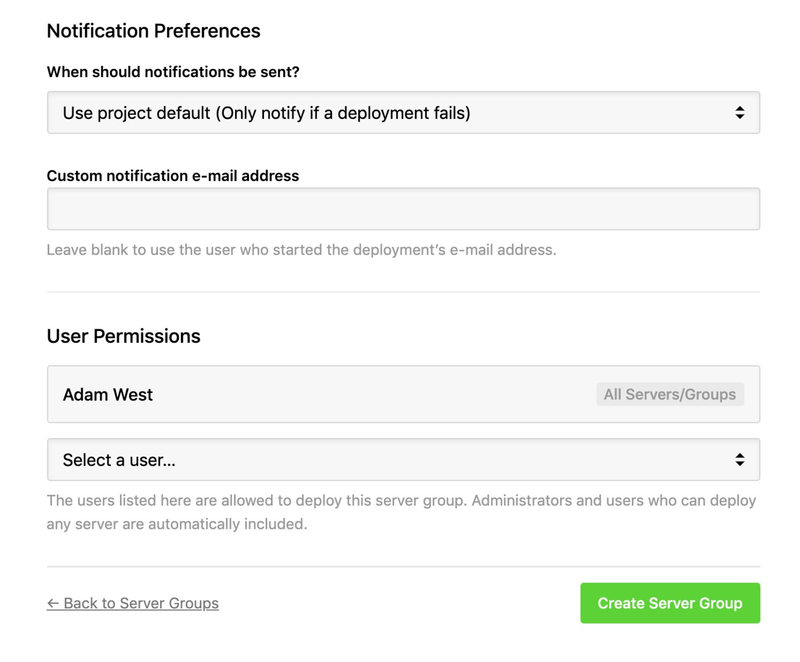 Finally, choose your notification preferences, select any non-administrative users you wish to provide access to the server group then click Create Server Group to finish. At the top of the page, you'll be able to select your server group in the Group dropdown, then click Update Server at the bottom of the page to finish. You can also select this option when you're adding a new server as well, if the group has already been created in your project. As well as being able to automatically deploy to a server in your project, you can automatically deploy to a server group. To enable this, head to the Automatic Deployments page on the left hand side, then toggle the option to enable automatic deployments next to the server group in the list. If you haven't already set up automatic deployments in the project as a whole, you'll see the automatic deployment URL in the middle of the page. 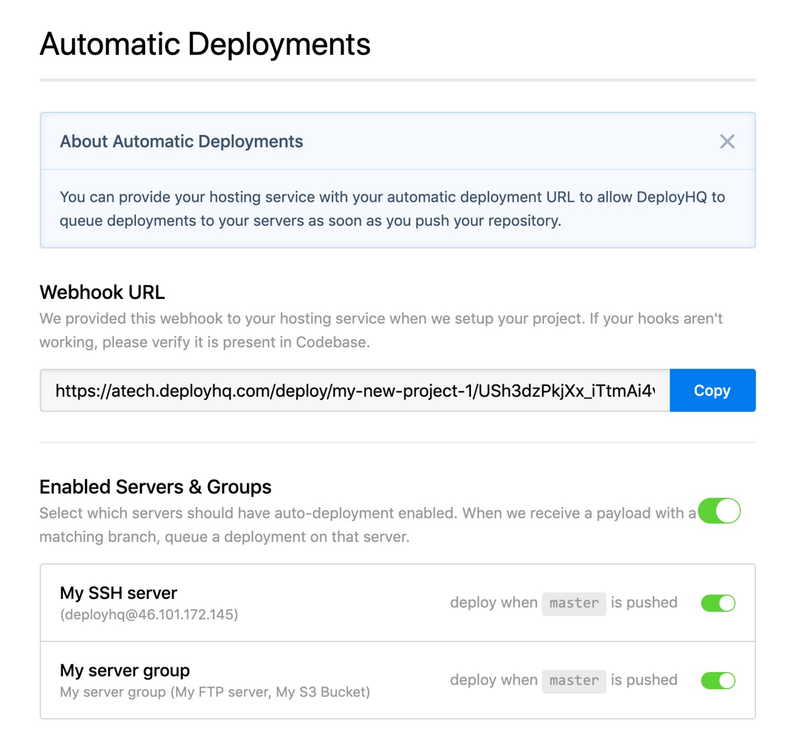 You can find out more information about how to add the webhook to your repository host in our Automatic Deployments guides.